Have you learned how to make baked whole chicken recipes? This terminology is often used interchangeably with roasted chicken. Although very similar, there are some differences in my opinion. First with the similarities; both can be cooked in the oven with the dry heat method. If I choose to roast a whole chicken in the oven, I place it on a rack in the roaster pan. For a baked whole chicken recipe, I will place in directly in the roaster pan at a lower temperature than the roasting process. As I learned how to make baked whole chicken recipes I found them to have a softer crust than a roasted chicken would have. Baking has to be done in some form of an oven but roasting a chicken can be done outside over an open fire; perhaps on a spit at a picnic or camp out. Which process is the best? It really is an individual preference; sometimes I like a bake whole chicken recipe and other times I prefer the roasted recipe. Much of the taste is in the spices and seasonings used to prepare the recipe. When you learn how to make baked whole chicken recipes you will be able to determine whether you want to bake or roast it. 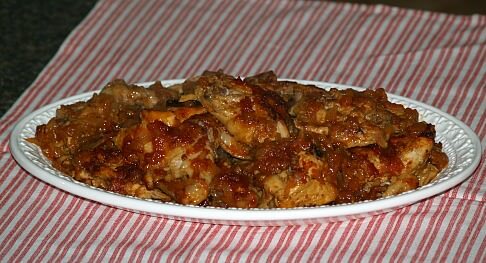 It is up to you but these are some of my favorite chicken recipes. The main reason is that they are so easy; I just place them in the oven and let them cook while I am doing other things. If I do not have time to marinate the chicken, I simply sprinkle some of my spice blend over it before placing in the oven; they are always delicious. The chickens are the best sellers of all the “poultry family”. Virtually every national and ethnic cuisine boasts of countless chicken recipes; Indian, all the Asian countries, French, German, Italian, Latin America as well as the United States and others. When making a selection for a baked whole chicken recipe, choose tender young birds under nine months old; older ones are best for stewing or boiling. 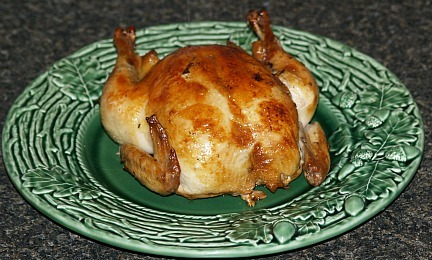 Chickens suitable for baked whole chicken recipes might be labeled in the supermarkets as broilers, fryers or roasters. The broilers are 8 to 14 weeks old and weigh 1 to 2 ½ pounds, the fryer is 14 to 20 weeks old and weighs 2 ½ to 3 ½ pounds and the roasters are 5 to 9 months old weighing over 3 ½ pounds. Generally speaking, I purchase fryers; I buy quite a few at a time and they can be used in everything from baking to frying or boiling. 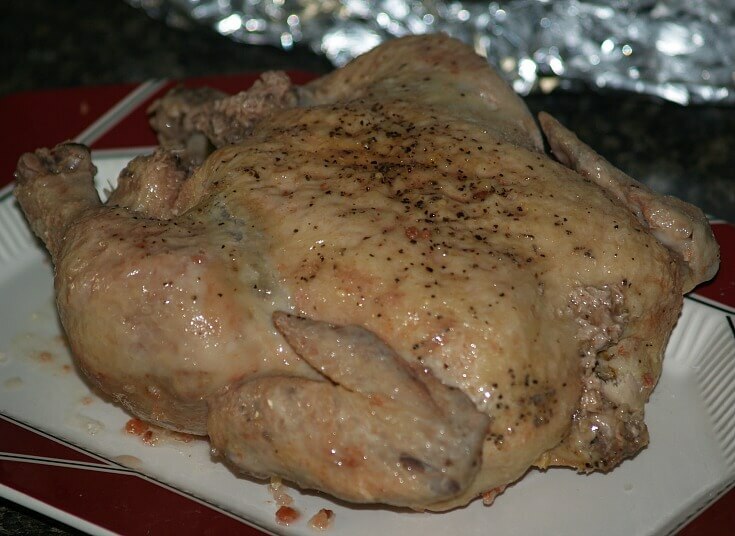 How To Prepare Baked Whole Chicken Recipe: Preheat the oven to 350F degrees. Rinse the chicken with cold fresh water and pat dry. Brush it with melted butter and place in roasting pan. Sprinkle salt, pepper and favorite spices over the bird. Allow 30 minutes per pound for chickens less than 4 pounds; allow 22 to 25 minutes for chickens more than 4 pounds. If a meat thermometer is used insert into the thickest part of the thigh muscle until it reaches 185F degrees. 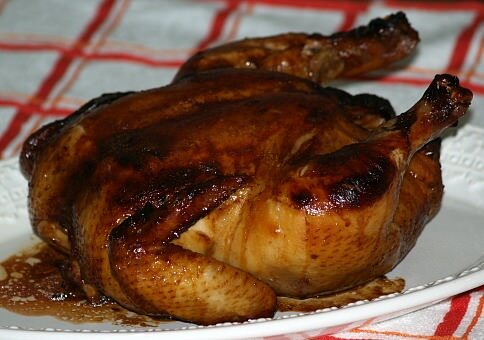 This is a very good marinade recipe for baked whole chicken recipes. Combine all ingredients except for the chicken in bowl and blend. Remove giblets from cavity, rinse chicken and pat dry with paper towels. Rub marinade all over chicken inside and out. Place chicken in zip lock bag and add any remaining marinade to the bag. Place in refrigerator for about 5 hours, turning chicken over occasionally. Spray roaster or shallow pan with non stick spray; place chicken in pan. Bake in preheated oven at 350F degrees for about 90 minutes or until tender and done. Combine flour, salt, pepper, paprika, oregano and curry to taste. Melt 2 tablespoons of butter in casserole or baking pan; place floured chicken in pan. Bake at 400F degrees until tender and brown; about 50 to 60 minutes. To make sauce dissolve bouillon cubes in boiling water. Melt 2 tablespoons of butter in saucepan; stir in flour; stir in the chicken bouillon mixture until thickened. 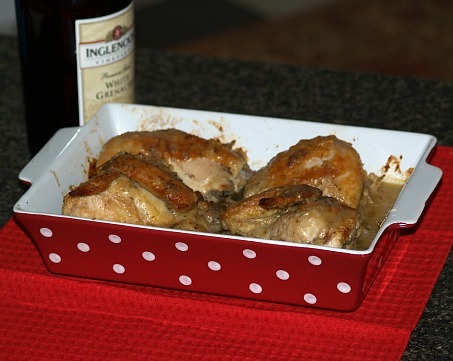 Stir in white wine; pour sauce over chicken and bake another 15 to 20 minutes. Brown chicken all over in hot melted shortening in skillet; place in a dip roasting pan. Add onion and celery to skillet; stir until tender. Add water, ketchup, lemon juice, brown sugar, Worcestershire, vinegar, salt, mustard, and red pepper to the skillet. Bring skillet mixture to a boil; pour over chicken. Bake uncovered for 1 hour or until tender. Remove all parts from chicken cavity; rinse with clean water. Place chicken in a 2 gallon plastic bag. In a bowl combine molasses, soy sauce, brown sugar, vinegar, ginger, sesame oil and pepper flakes; pour over the chicken. Seal bag tightly and marinate in refrigerator for 3 to 5 hours; turn frequently to keep chicken coated. Roast chicken about 90- minutes or until thoroughly cooked and very tender; baste frequently. Rinse chicken and wipe dry. Place tarragon inside cavity of chicken. Sprinkle inside and out with pepper. Tie chicken legs together with meat string. 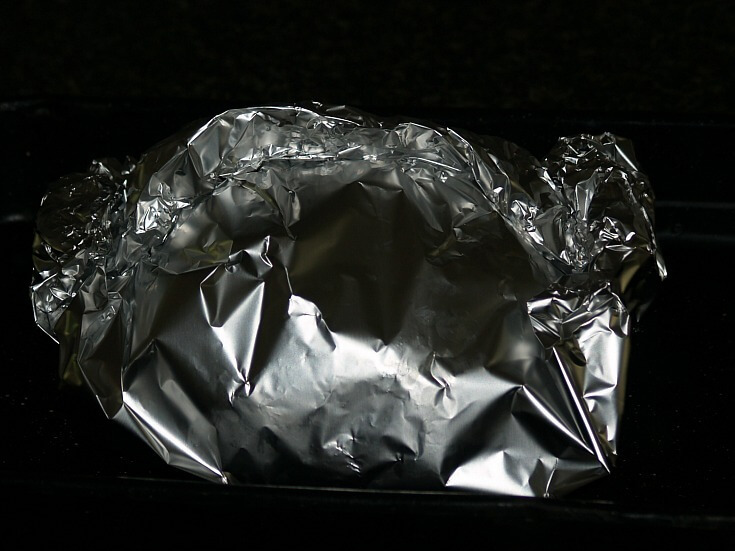 Line baking pan with large sheet of foil. Spread a THIRD of the salt over the foil. 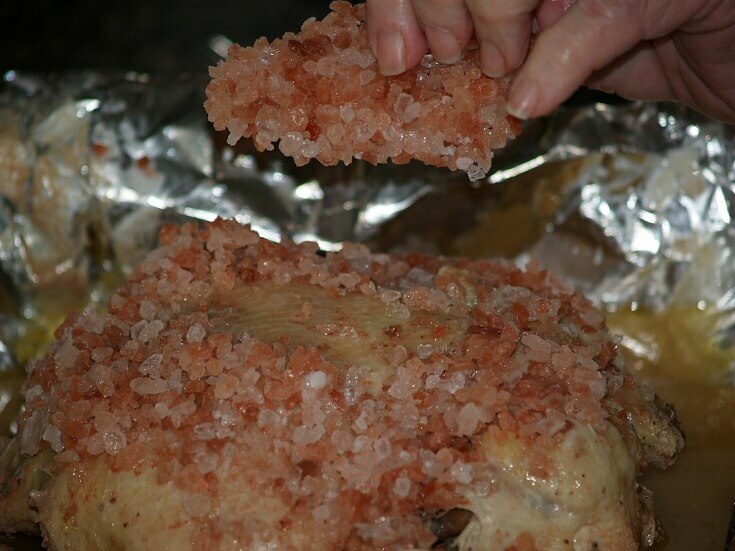 Place breast side down on the salt covered foil. 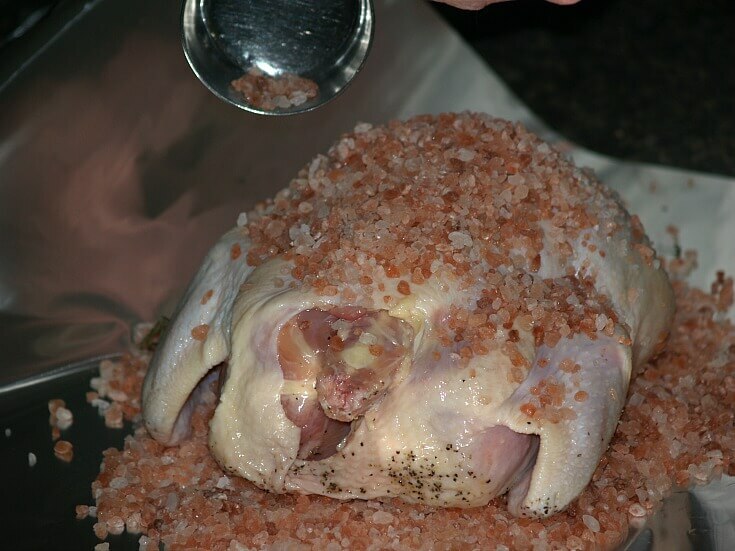 Cover chicken completely with remaining salt. Wrap foil up around chicken pulling together and sealing tightly. Bake for 1 ½ hours (DO NOT cover with additional lid). Remove chicken from oven and unwrap. Remove crust of salt and brush off any salt that clings.